Kalimpong is all set to be declared a separate district West Bengal on Valentine's Day. The day will be a day for celebration and will be remembered by the entire populace who wish to see Kalimpong as a separate district. Chief minister Mamata Banerjee is officially visiting to formulate Kalimpong sub division into a district. 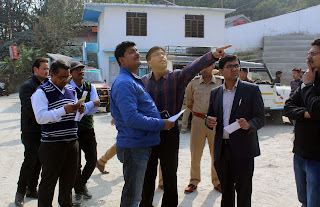 Today Darjeeling SP Amit P Jawalgi along with Darjeeling district magistrate Anurag Sriwastav and additional district magistrate, Darjeeling, visited Kalimpong ahead of the chief minister's visit schedule for 13 February. When asked about the chief minister's visit Mr Sriwastav said Miss Banerjee will arrive on 13 February and will return on 16 February. "Permanent land has been identified where the construction will take place. In some cases tender procedure has been started by PWD and designing works are ongoing. It may take a year or two to get the infrastructure ready.Delo,PWD office,ASP office,PTTI lands has been identified where new construction will take place," informed the district magistrate. Meanwhile Darjeeling superintendent of police Amit P Jawalgi said, "We have sent a proposal of man power,vehicles and other for sanction. A proper district police unit will start from 14 February." 0 Respones to "KALIMPONG ALL SET BE DECLARED A DISTRICT"